In the summer of 2010, artist Tom Bogaert embarked on another chapter of his ‘Impression proche orient‘ leading him to Syria to work on a series that was exhibited at Le Point in Aleppo, Syria in August. The base for Bogaert’s IPO is president Bashar al-Assad’s story that he wasn’t supposed to rule Syria. His older brother was the heir apparent, but was killed in a car crash. When their father, president Hafez al-Assad, died in 2000, the mantle fell to Bashar al-Assad. Suddenly, an unassuming man, who had been studying to become an ophthalmologist in London, was president of Syria. Here are a few questions that I had for Bogaert, about the series and the subject that inspired him for this series. AB: How long have you visited Syria? Was this your first time in the country? TB: Since the end of 2009, I’m based in Amman, Jordan. This summer (2010) I was in Syria for over a month to work on the Syrian chapter of IPO. (the capital Damascus is about three hours driving from Amman; Aleppo is a nine hours drive). I had been in Syria before but never purely in the context of ‘Impression, proche orient’. AB: How did you become interested in Bashar al Assad as a subject? TB: The idea behind IPO is to do research, study countries, read about them , spend time in the countries, leave and return, work with local artists, get drunk with them and share insights. Eat Drink Learn Love. Through visual art, I try to provide a fresh look at the Near East and its peoples and leaders. I love to read about foreign affairs, I love to hear about the latest geopolitical gossip, I read Amnesty International’s , the CIA, Wikipedia and Human Rights Watch reports, I read magazines and I watch Al-Jazeera 24/7! While I recognize the fluidity of geographies, I’m also fascinated by genuine Near East national identities created by political boundaries drawn onto maps sometimes only 50 years ago. That’s why my chapters deal with countries, territories and nation states. IPO sometimes feels like a return to the core of my artistic identity: a visual translator of geopolitical and social issues. Chapters of my Grand Tour might be situated at the crossroads of visual art and journalistic reportages. Although I’m not sure about that. Usually when I start a new chapter, I hope, I wait (I don’t pray) for a clear moment, something that will guide me through the dark artistic night. Again, I’m fully aware of this reductionistic approach but I have to start somewhere. In Jordan cucumbers ignited me. In Syria it was the story about Bashar al-Assad: almost like a Story from One Thousand and One Nights. AB: How does the general public or artist community feel towards his leadership? TB: On May 27, 2007 Bashar was approved president for another seven-year term, with 97.6% of the votes in a referendum without other candidates. AB: I could imagine with his disinterest in his family’s politics and passion for ophthalmology it would be likely that he is a complacent leader. Would I be wrong in saying that? TB: In the beginning of Bashar’s presidency there was a brief “Damascus Spring” in which he released political prisoners and eased press restrictions. It didn’t last. 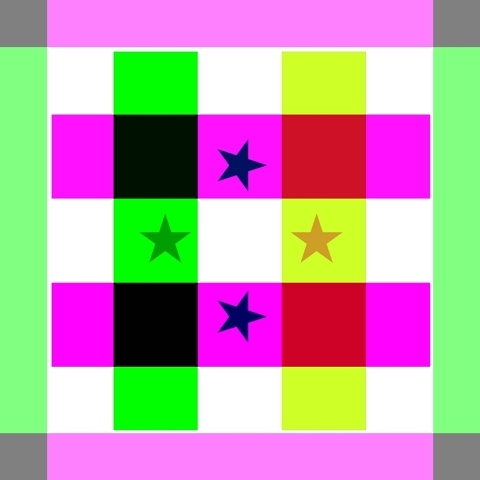 The question for me is not whether president Bashar al-Assad has become an earnest technocrat or an ideological demagogue, the question is rather: does Dr. Bashar still dream about tumbling Eye Doctor E charts and the course for Syria they might chart: left, right, up or down? Tumbling Es as rudderless symbols for Syria’s evolving foreign and domestic policies overflowing with apparent contradictions: its self-proclaimed goal is peace with Israel, yet it has allied itself with partners vowed to Israel’s destruction. It takes pride in being a bastion of secularism even as it makes common cause with Islamist movements. It simultaneously has backed Iraqi Sunni insurgents and a Lebanese Shiite armed group. Or are the president and his wife just plain sad walking down the boulevard of the broken eye-doctor-with-maybe-a-state-of-the-art-private-clinic dreams? AB: I am taking that your work, “Minecraft Mausoleum” is a symbol of Al-Assad’s interest? That the “E” of the eye chart and his introduction of the internet to Syria in 2001? TB: Bashar al-Assad is indeed known to be a computer geek. He used to be chairman of the Syrian Computer Society and has surrounded himself with a number of techies. Internet censorship however is extensive and targets social networks and blog platforms in an effort to prevent dissidents from getting organized and recruiting new members using the new media. Some social networking sites such as Facebook, Twitter and YouTube, are also proscribed. The tumbling E eye chart is the alpha and omega of the Syrian IPO chapter. 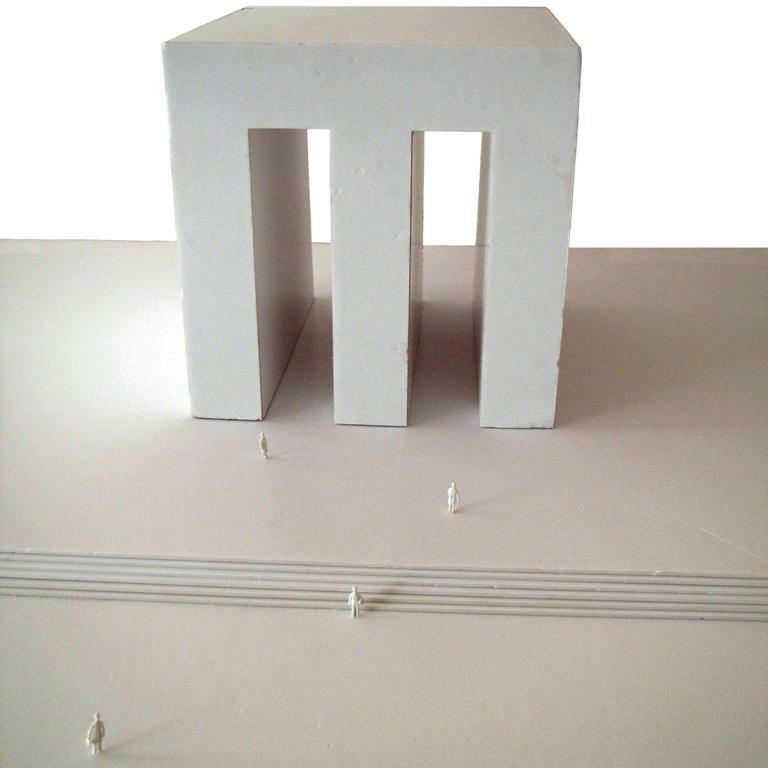 The M shaped mausoleum (“E down”) might be how Bashar’s Mausoleum might look like. His father Hafez and brother Basil are buried in a vast echoing mausoleum in the city of Qardaha. As a (former?) 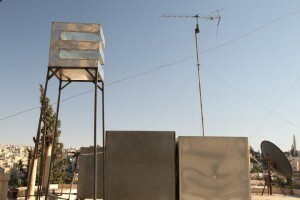 geek, Al Assad might find it interesting to start building his own Mausoleum – online. "Minecraft Mausoleum" by Tom Bogaert. 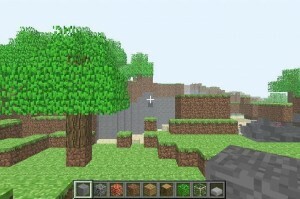 Minecraft is a building video game which allows players to build constructions out of textured cubes in a 3D world. AB: The work, being in the public virtual realm of Minecraft is open for people (via avatars) to build their own mausoleum? Has there been any virtual movements in construction? AB: The beautiful “Water tanks” that you have constructed, do they function? 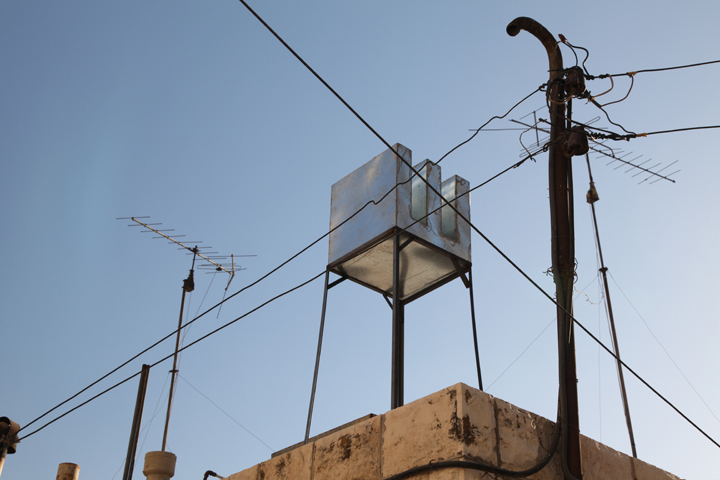 TB: Initially the water tanks were intended to function as rooftop showers. An homage to the first lady of Syria and inspired by Leonard Cohen’s Hallelujah Lyrics – “you saw her bathing on the roof, her beauty in the moonlight overthrew you”. 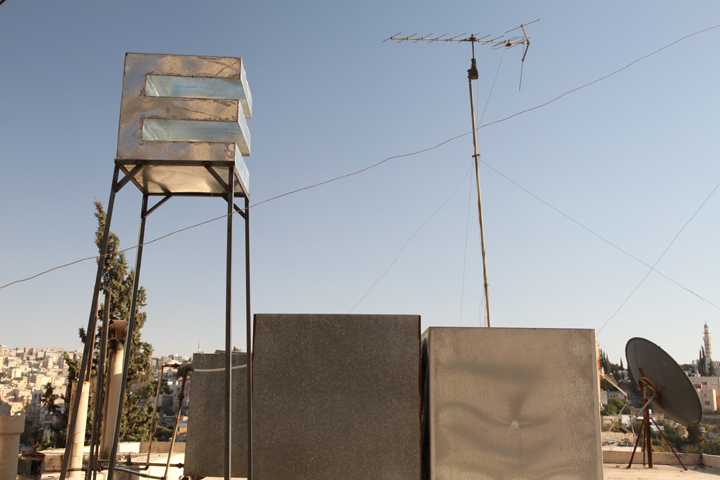 An homage also to Damascus Skyline and its ubiquitous water tanks. After we had installed the first water tanks on the roof, it felt to much clutter with the pipes and the story. Now they are just watertanks in the shape of Eyechart Es. I might change my mind about this. AB: Does syria use tanks to gather rain on their roofs, or for storage? You said in our last correspondence that there hadn’t been rain in quite some time. TB: Storage and pressure. Water is pumped up by the municipality only twice a week and its then or never. Water resources management in Damascus, a metropolitan area with more than 4 million inhabitants, is characterized by numerous challenges, including groundwater over-exploitation, increasing water demand, intermittent supply, and pollution. The quality of residential water supply mirrors social divisions within the metropolitan area, with the poorest neighborhoods receiving the worst service. AB: Lastly, after your stay in Syria what would you say is the most lasting impression of the country? TB: The eagerness for change and the beauty of the first lady – in the moonlight.